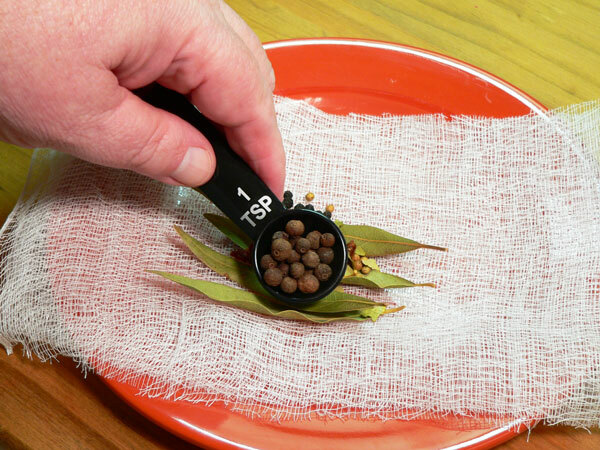 Follow our step-by-step, photo illustrated instructions for a quick and easy Beaufort Stew Recipe. When a recipe says “just dump it all in the middle of the table when its done,” that should be enough to make you want to try it. This recipe is easily adaptable to any size family and friends gathering you might be having but, we’re breaking it down to serve 2 – 3 folks. It cooks in one pot in less than an hour, how much easier can it get? That’s my older brother Elvin on the left and, our new friends, Linda and George on the right. 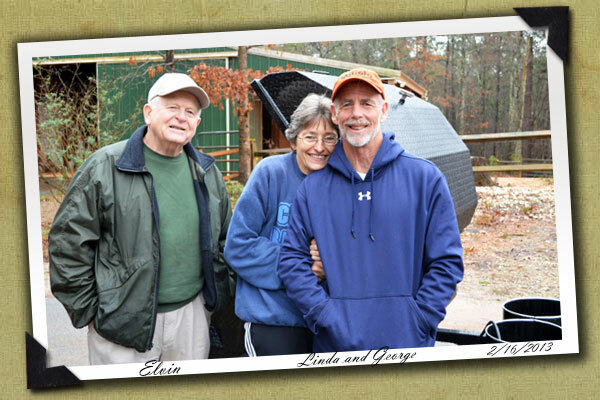 Linda and George are from Little Mountain, South Carolina and we met them the day we delivered one of my brothers pig cookers to them. It was a cold and wet day in the middle of February as we arrived at their house but, their kindness and friendship quickly warmed us up. George and Linda have a son serving in the military and a daughter that has just graduated as a Doctor of Veterinary Medicine. We met her as well as she came outside, barefoot, to take a quick look at the new pig cooker. George and Linda are planning a big cookout for her in just a couple of weeks in honor of her graduation. Obvious animal lovers, they have a beautiful home, with lots of horses, dogs and at least one cat roaming around. George even shared some of the collards he was growing with my brother. I made sure they went in the BACK of the truck on the trip home. Just saying. During our time there we of course started talking about food. George and Linda were planning a family meal that very evening and mentioned they would be having something called “Beaufort Stew.” That caught my attention. I had never heard of Beaufort Stew and wanted to learn more. After describing the ingredients and how it all was cooked in one large pot, I told them I hoped they would send me the recipe for it as I’d like to give it a try. They agreed and, sure enough, the very next evening, I had a very nice E-mail from them with the basis for making the stew. George said his son had cooked the stew for them the night before, that he did a great job and, it appeared they had taught their son well. All it took for me to try it was seeing a big bag of red potatoes on the Reduced Sale Items shelf at the grocery store the next day. Seems I’m easily motivated when it comes to food. I had to improvise a bit on some of the spices as my store didn’t carry the Crab Boil in packets that the recipe calls for. I whipped up my own little packet based on some Internet recipes and using what I had on hand. My Beaufort Stew turned out to be delicious and I think you’ll be well pleased if you give it a try. You’ll find my adaptation in printable form below and then we can all say Thank You to George, Linda and, their family, for sharing a new favorite for us here on Taste of Southern. Ready to get that pot going? Alright then… Let’s Get Cooking! 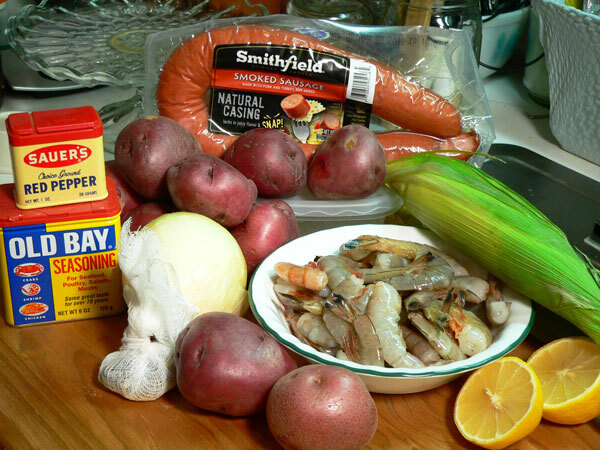 Beaufort Stew Recipe: You’ll need these ingredients for the main stew. 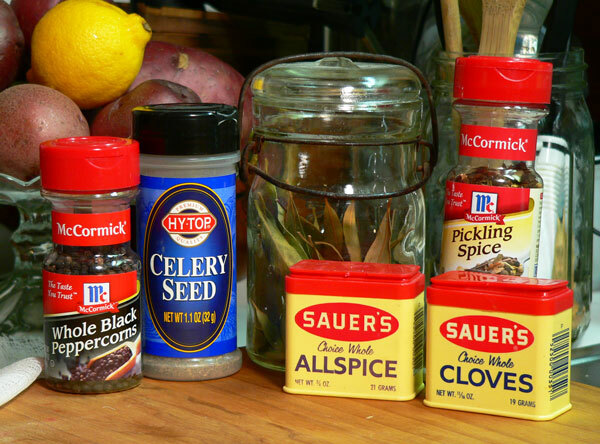 My Crab Boil Seasoning Ingredients: You’ll also need some of these spices if you can’t find the Crab Boil Packets. Linda and George’s recipe called for Zatarain’s Crawfish, Shrimp & Crab Boil-in-Bags. I didn’t find those at my local grocer so I searched the Internet on how to make a substitute. It’s pretty simple and I had most of the spices in the cabinet. I did end up using Ground Mustard since I didn’t have any Mustard Seeds and Garlic Powder instead of fresh Garlic. 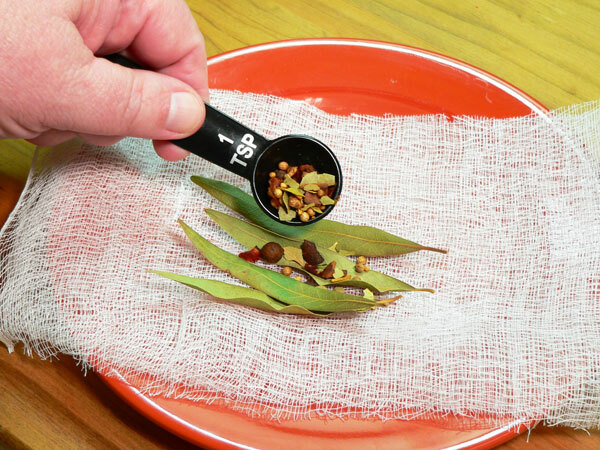 I’m including the step-by-step for my spices but, if you find the Boil-in-Bags, you can use that instead. And of course, I’ve just realized that I didn’t include the Mustard and Garlic Powder in the photo above. Oooops! 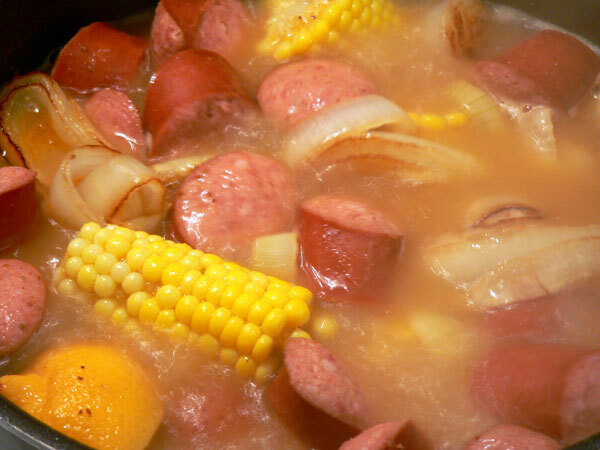 If you can find the Boil-in-Bags in your area, you can just skip on down to the main part of the recipe. 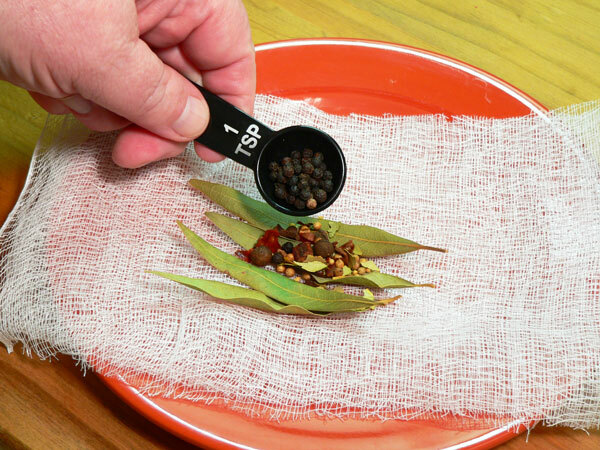 You’ll need a piece of cheesecloth to tie the spices with. 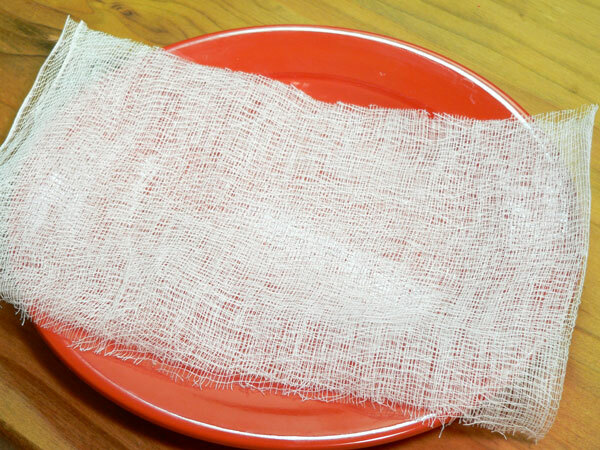 Cheesecloth is something I’ve discovered that is very important to always keep on hand. 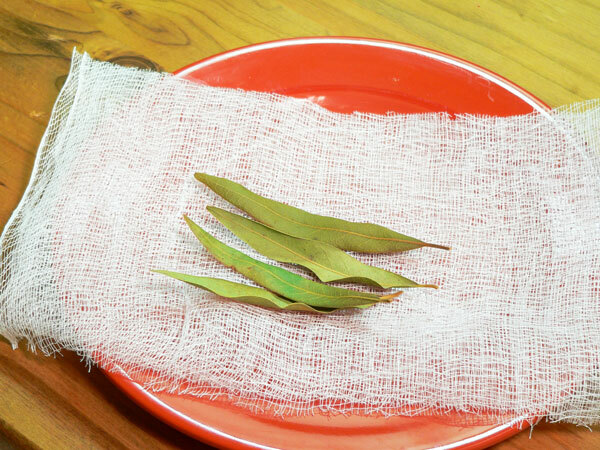 Begin by placing about 4 Bay Leaves on the layer of cheesecloth. Add the Ground Mustard. I didn’t have any Mustard Seed as most recipes called for so, I substituted some Ground Mustard. Yes, a lot of it will probably fall out of the cheesecloth but that’s OK, I can just dump it into the pot. 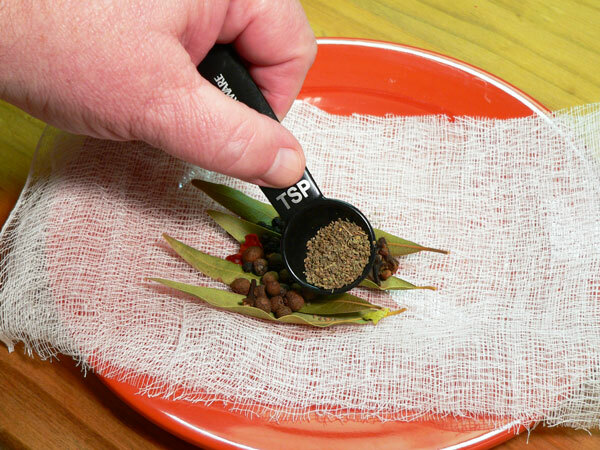 I’m listing Mustard Seed in the printable recipe by the way. Add the Garlic Powder. Yep, some of this will fall through the holes in the cheesecloth but, not much. 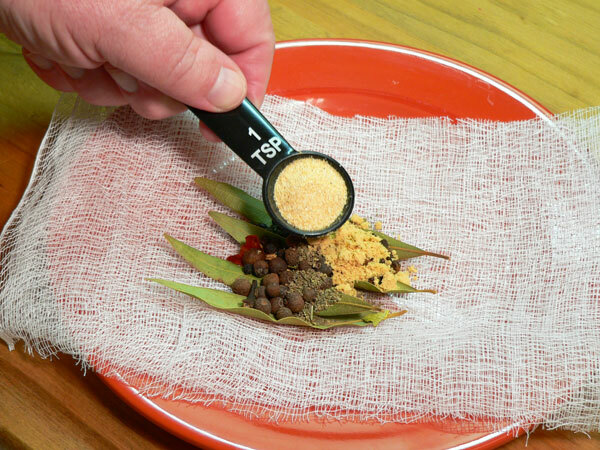 Once all the spices are added, tie the bundle together with some kitchen twine. Kitchen Twine is yet another one of those things that is always handy to have around. The spices that fell through were just added into the pot later on. Note To Self: Buy some more kitchen twine, you may not be lucky enough to have some on a bag of stone ground grits next time you need it. Get a large stock pot or even your canning pot if you have one. I suggest you use the largest pot that will fit safely on your stove top if you’re preparing a smaller batch of Stew inside. I used this shorter pot because it’s easier to take pictures when adding ingredients but, I realized by the time that I was finished that I needed something about twice this size. The ingredients need lots of room to swirl around in as they cook. 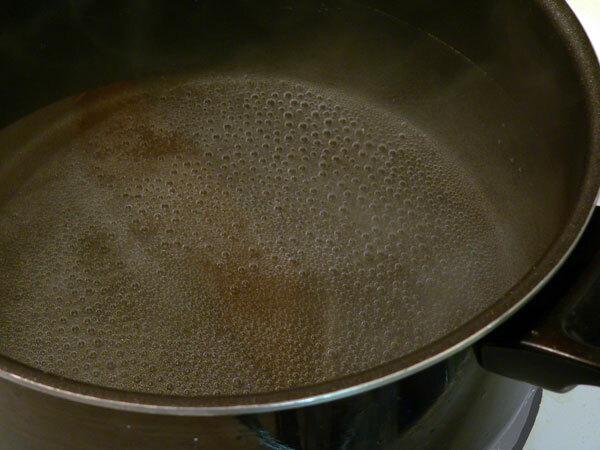 Bring the pot of water to a rolling boil over Medium-High heat or a little above. 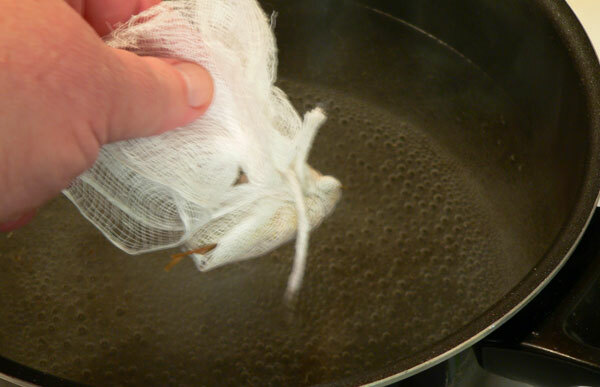 Once the water begins to boil, drop in the spice bag. Add in the Old Bay Seasoning. I only used two Tablespoons and found it was pretty much just what I wanted for my own personal taste. Start out with a small amount such as this and, increase it later if need be. Once the potatoes get to cooking, you can always taste the liquid to see if you think it needs more spice. Hot and Spicy: Adding the Crushed Red Pepper Flakes is optional. You can make this whole thing as hot and spicy as you like. Call me a wimp, I like a little spice but, not enough to make me fan my mouth trying to cool my tonsils down. Squeeze each half of the lemon into the pot. Catching the seeds is entirely up to you. I just let them fall where they may. 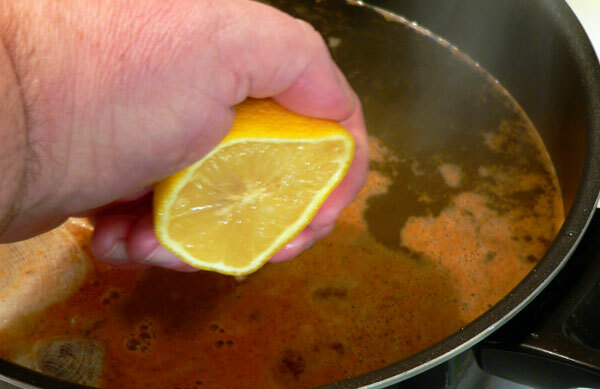 Once you’ve squeezed the juice from the lemon, go ahead and toss the lemon into the pot for some added flavor. The whole thing. 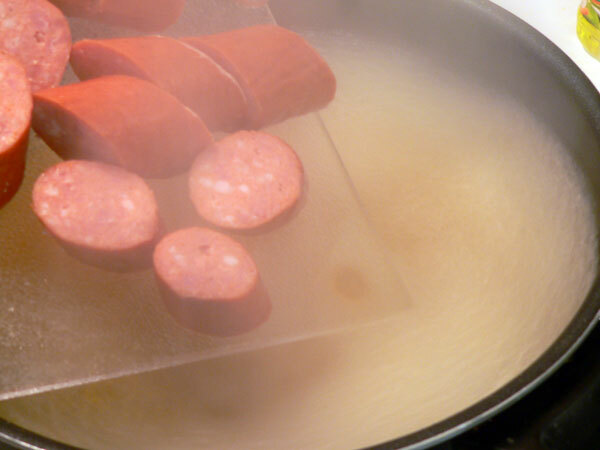 Slice your Smoked Sausage into pieces about 1-2 inches long. Make it pretty and cut them at an angle. Toss the slices into your pot of boiling water. Let this boil for about 15 minutes before adding the next ingredient. While the sausage is cooking, slice the Onions. 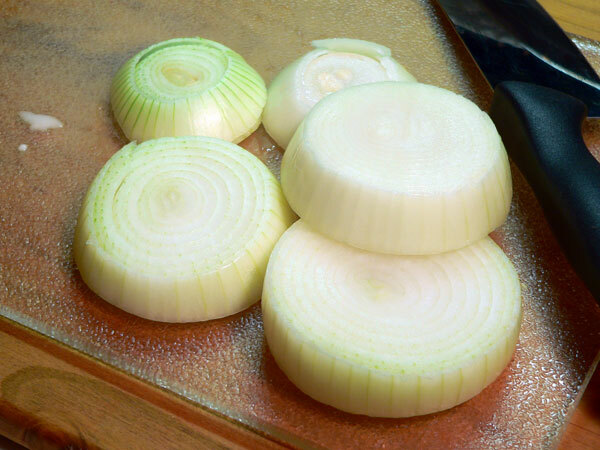 Remove the outer skin from the onion and slice the onion into pieces about 3/4 of an inch thick. I opted to cook my onions a bit before adding them to the pot. Yes, you could just toss it into the pot and let it boil along with everything else but, I think you can add even more flavor by cooking them a bit first. I heated up my cast iron skillet, added the onions and then tossed in about a Tablespoon of Butter. 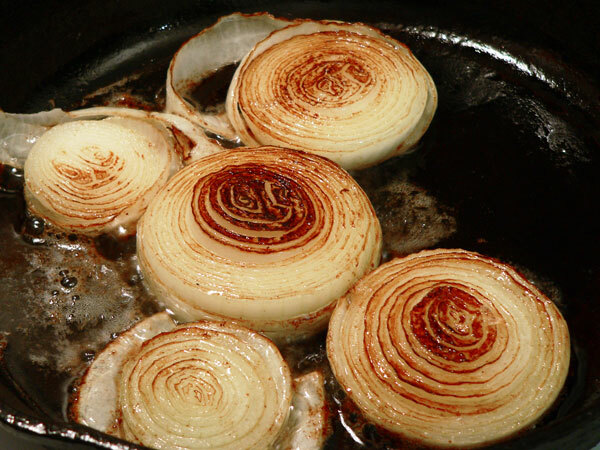 Onions cooking in butter just smell… divine. Let the onions cook about 5-8 minutes over Medium heat. 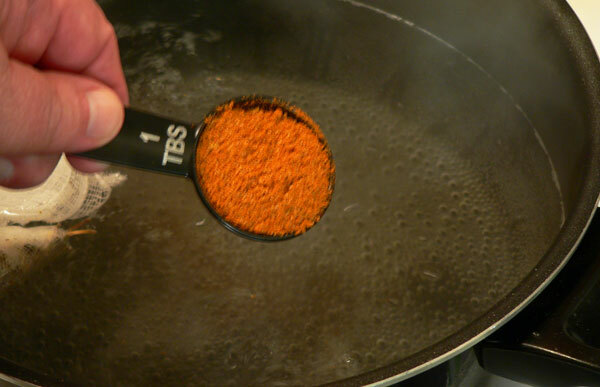 Then, flip them over and cook the other side about the same amount of time. After about 5 minutes on the second side, I cut the heat off to my skillet and just left them in the pan for later. What is it about the aroma of cooked onions that always makes me think about fairs and outdoor festivals? 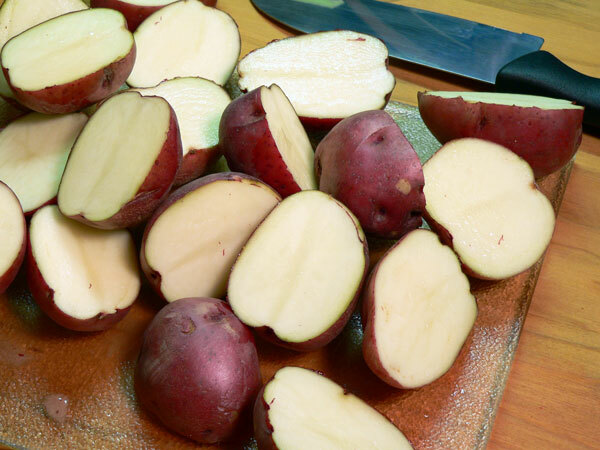 If your potatoes are large, you’ll want to at least cut them into half. Linda and George said they didn’t like the really small Red Potatoes nor the big ones either. They prefer a medium sized potato they said. I don’t know if they cut those up or not, they didn’t say in the information they sent. I suspect they don’t though. I paid about a dollar for this bag that was on the Reduced Price shelf. It contained various sizes so I tried to pick out the smaller ones. I suggest you go with a small to medium size potato and not cut it. Cutting the potato seemed to make it a bit more mushy I think. Also, don’t let your potatoes over cook. Add the potatoes to the pot. These will need to cook 15 minutes before adding the next ingredient. Prepare the corn. Talk to it, tell it whats about to happen to it. Wait… what am I talking about here? 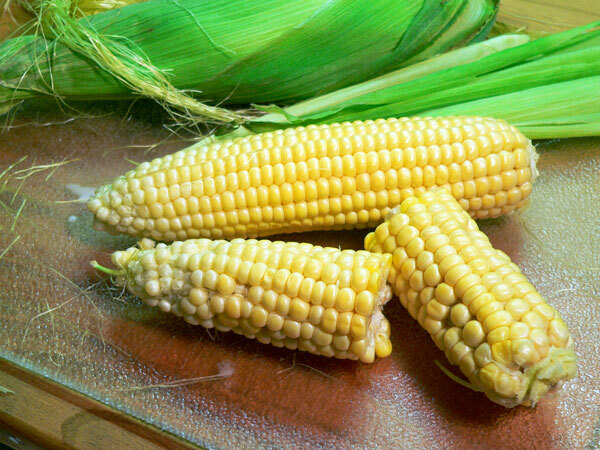 No, shuck the corn to remove the husks and silks from the ears. Then, break each ear into halves. It’s winter here and this isn’t the best looking corn in the world but it works. Beaufort Stew is normally prepared outside, using a gas burner and a large stock pot, much like you might see for frying a turkey. The really neat part is that you can pretty much prep new ingredients while the ones you’ve added to the pot are cooking. You could even get several people involved and make the whole thing a true family affair. Even the kids can shuck corn and have fun at the same time. Well, maybe. It’s a thought anyway. Smile. 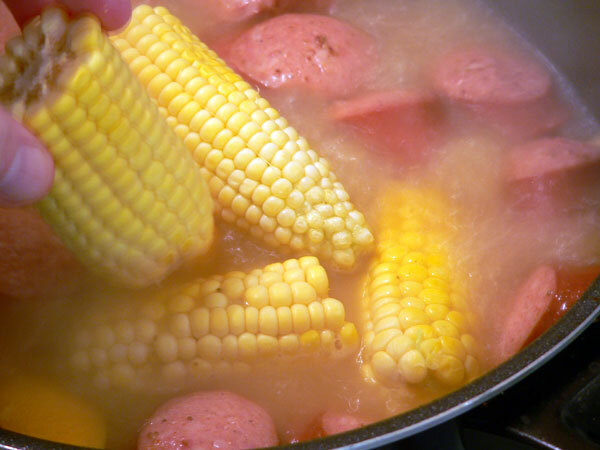 After the potatoes have cooked for about 15 minutes, add the corn into the pot. According to the recipe, the corn will also need to cook for 15 minutes. I think the best thing to do is keep an eye on the potatoes from here on out. When the potatoes are done, the corn should be done so, don’t overcook the potatoes at this point. 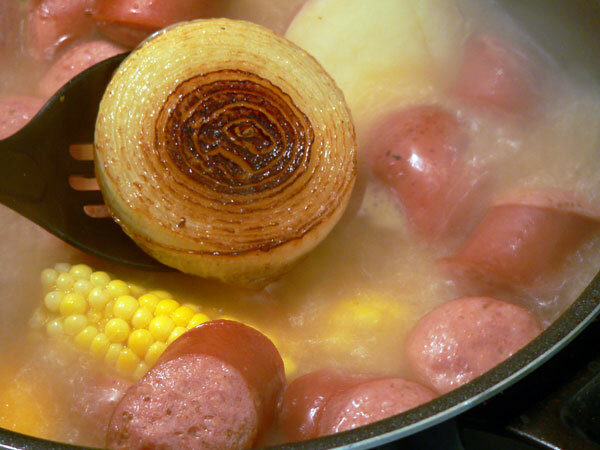 Right after you add the corn, go ahead and add the Onions into the pot. Stir everything around and let the pot continue to boil. As you can see, my pot is full of food at this point. As mentioned earlier, use the largest pot you have so everything has plenty of space to swim around in. 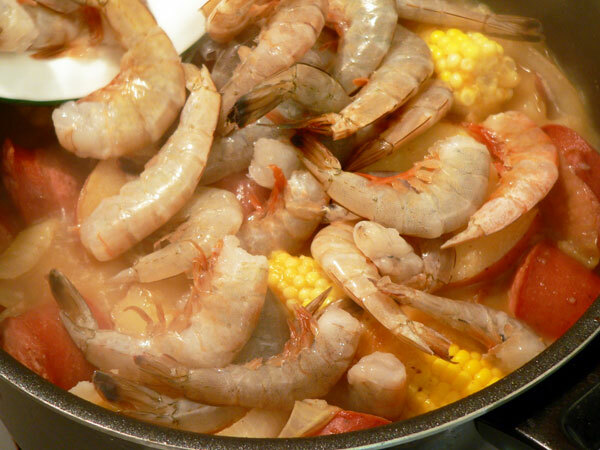 While the potatoes and corn finish cooking, go ahead and prepare the shrimp. I’m using a large shrimp but jumbo shrimp would be great… if you can afford them. These are listed as Large Fresh Shrimp in the grocery store and they still have their shells on them. I just rinsed them off under some cool running water to remove any debris that might be with them. 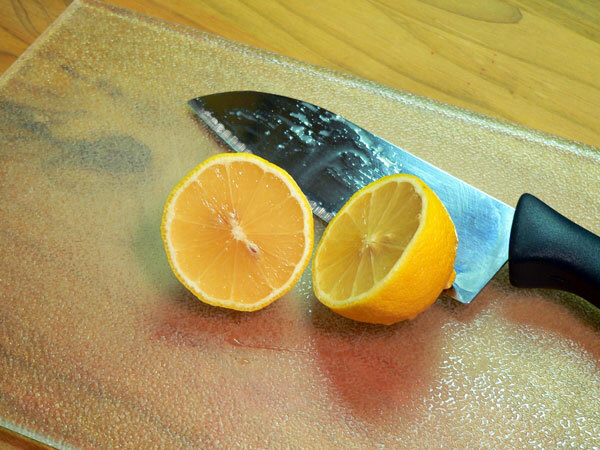 Whether you decided to peel and devein them is up to you. It seems folks do them both ways. Part of the “fun” is suppose to be in sitting around the table peeling shrimp while you drink tea and enjoy the time with family and friends. Please note that the shrimp will cook in about 3 minutes. You want to have everything else ready to serve before you add the shrimp into the pot. Be prepared to commence eating and let everyone ooh and ahh as you drop in the final ingredient. Gently stir the shrimp around and watch as the shells and all turn red in color. Just be sure you don’t over cook the shrimp or they will be tough. Having everything else ready to go at this point is pretty crucial to the success of your meal. 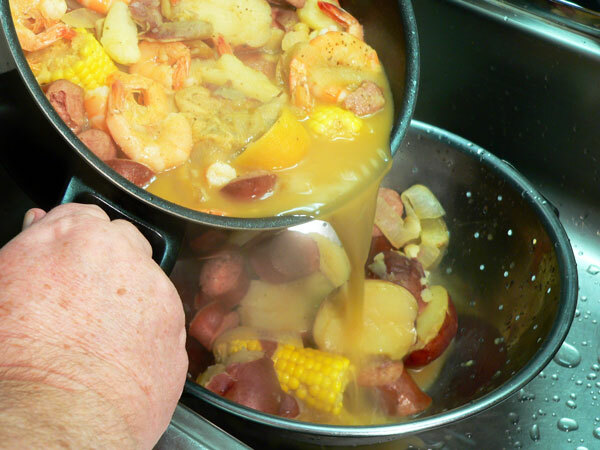 As soon as the shrimp turn red, drain the pot of it’s liquid and serve everything up while its hot. Cover your table with one of those Dollar Store plastic tablecloths, then spread a couple of layers of newspapers on top of that. 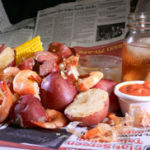 Just like the Crawfish Boils and all the other types of Seafood Boils, this is best when you just dump everything out into the middle of the table. The kids will think you’ve flipped when they see this one. Guests can just stand around and pick and choose what they want as they go or, they can scoop up spoonfuls onto plates. Just have plenty of paper towels or napkins on hand because its suppose to be messy. Serve it up with your favorite Cocktail Sauce, Hot Sauce, melted Butter and a bunch of Southern Sweet Tea. Are you hungry yet? Its time to eat! Special Thanks: My special thanks to Linda, George and, their family, for sharing this recipe for Beaufort Stew. I’ll be looking forward to seeing what you cook up on your new Carolina Cookers grill. Send us some pictures… OK? George points out that Beaufort is pronounced “Bu-fort, not Bo-fort.” He says he’s been to both places and likes them both. Seems there is a Beaufort, South Carolina and a Beaufort, North Carolina but we’ll take this big old pot of stew from either one. I hope you’ll try it at one of your next family get togethers. It’ll be a lot of fun I promise. 1 large Onion, sliced and sautéed in butter. 1 Lemon, sliced in half. 1 bag of Zatarains Crawfish, Shrimp, Shrimp & Crab Boil-in-Bag or, use my recipe below. 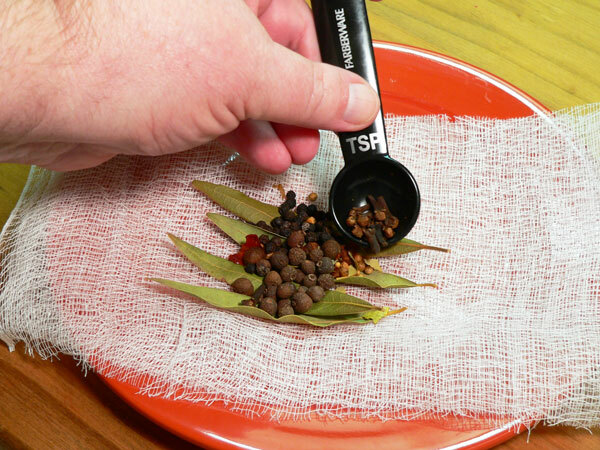 1 teaspoon Yellow Mustard Seeds. 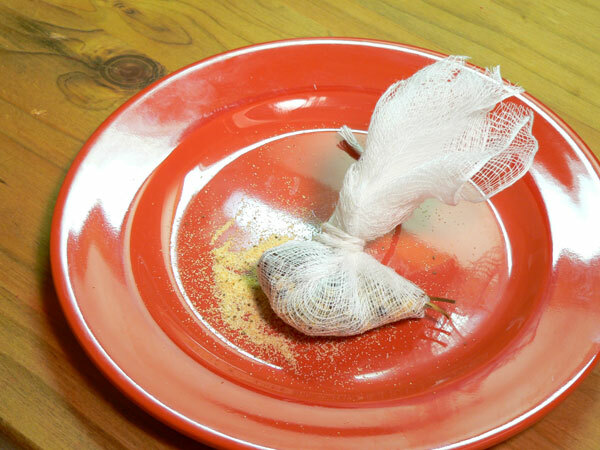 Place all ingredients between layers of cheesecloth, tie into bag. Place a large stockpot, half-filled with water, over Medium-High heat. Add the bag of Shrimp-Crab Boil Seasoning and bring to a rolling boil. Squeeze juice from Lemon into pot then, toss both halves into the pot. 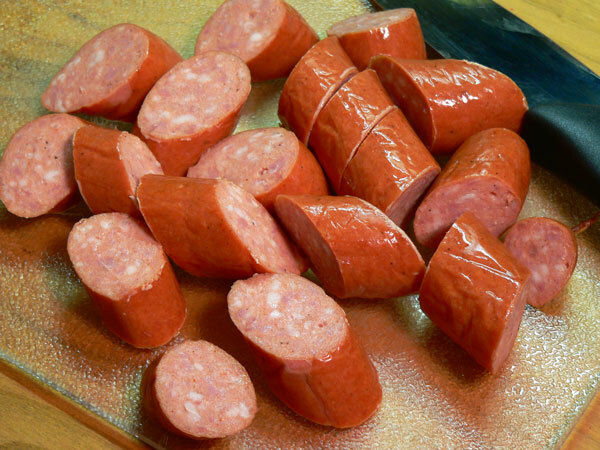 Slice Sausage into 1 – 2 inch links. 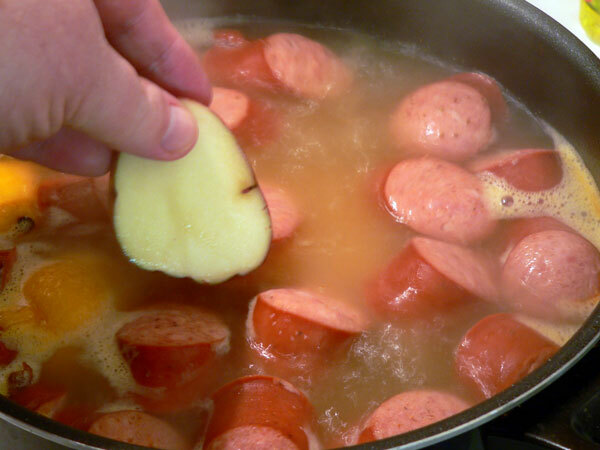 Add the Smoked Sausage to the pot of boiling water and spices. Let Sausage boil for 15 minutes. 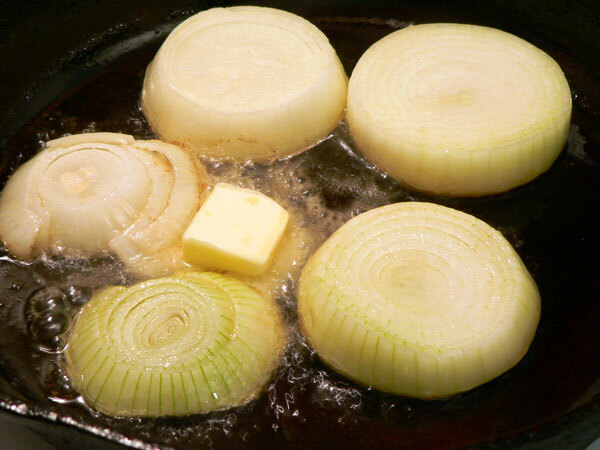 Slice one large onion into ¾ inch thick slices, sauté in butter until tender. Continue to boil for another 15 minutes. 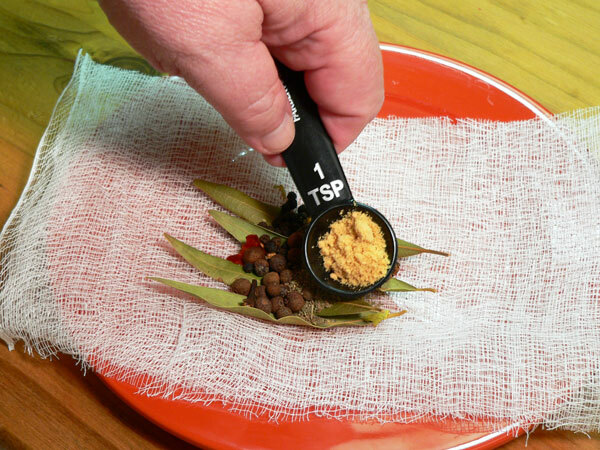 Shuck corn, remove silks, break each ear in half. Add the corn to the pot. Continue to boil for 15 minutes. 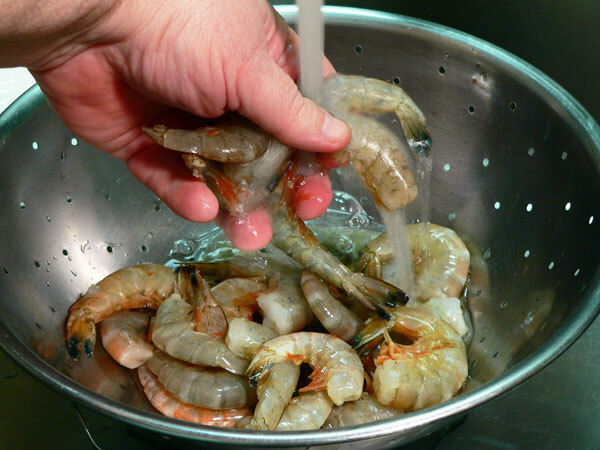 Rinse the shrimp under cool running water, prepare as needed. Boil for 2-3 minutes until shrimp shells turn red. Do Not Overcook the shrimp. Drain the water by pouring through a large colander. Cover the table with newspaper, pour everything into the middle. Serve with warm butter, Cocktail Sauce and Enjoy! 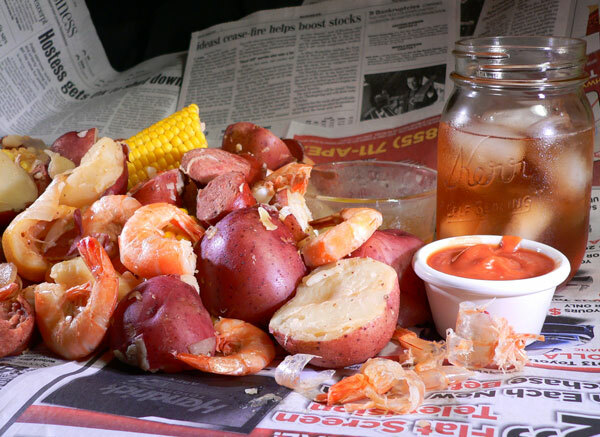 Your Comments: Have you ever had a Seafood Boil? I had heard of them but it’s not something my family has ever done. I’m going to have to change that though after having tried this miniature version. We normally cook hamburgers and hot dogs or, BBQ Chicken for most of the family get togethers for birthdays etc.. This would be a pleasant change to all of that. It would also be fun to do on a trip to the coast some time. I do hope you’ll at least give my simple version a try. As I’ve said, you can keep adding and spreading this thing out until you could feed a large group of people. You could cook up one batch and be enjoying that while another batch cooked in the same juices. I’ll look forward to hearing your comments and thoughts about this recipe. It will only take a minute or two for you to leave us a comment in the section below. Just remember that all comments are moderated. That means I read each and every one of them before they are approved for our family friendly site. I also try to respond to as many of your comments as possible, so, jump in and share in the conversation. Also, don’t forget to Subscribe to our Newsletter. Just enter your Email address in the box below or at the upper right hand top of each page. I send out updates each week about our latest recipes and any other important things as they happen here at Taste of Southern. If you like our site, please share us with your family and friends. I’d greatly appreciate that also. Thank you for your support. Great pictures and loved the way you talk! I just found this beautiful website and I’m finding myself spending way too much time here. I’m an Alabama girl and your recipes have taken me home. It’s funny how food can bring back so many memories.